When a comment is made that has the potential to offend a certain group, anecdotal evidence suggests that listeners will immediately look at any members of that group who are present. Why is this? One possibility is that when a potentially offensive remark is made, people practice social referencing - they determine if discrimination has occurred by measuring their own reaction against the reaction of an individual with perceived standing. We used eye movement research to find out if this anecdotal experience is a reliable phenomena, and to investigate the social referencing hypothesis (Crosby, Monin & Richardson, 2008). 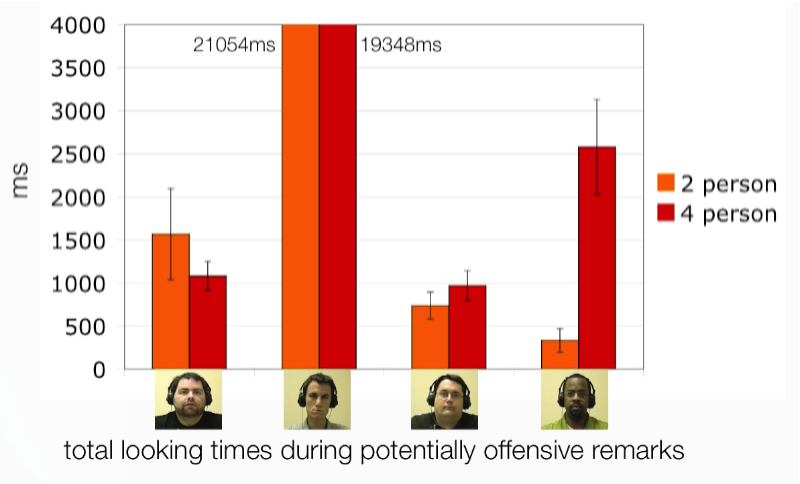 In our experiment, participants were eye tracked as they watched a video of four males (three White and one Black) discussing university admissions (see above right for a excerpt). All four discussants were visible at all times. As one discussant voiced strong opinions against affirmative action, we measured the amount of time participants looked at the other discussants. If our anecdotal situation holds true, there will be more looks to the black individual at this point. The anecdotal evidence was confirmed: participants did fixate the Black individual when the potentially offensive comments were made. Many strands of eye movement research would predict this result. The looks could be due to a simple association between what is being said and what is in front of them. Eye movements often reveal such ‘low-level’ effects in which words, or parts of words, can trigger looks to potential referents in a scene (Tanenhaus, Spivey-Knowlton, Eberhard & Sedivy, 1995), even when those part words are names from a different language (Spivey & Marian, 1999), or the referents have been removed and the locations are empty (Richardson & Spivey, 2000; Spivey & Geng, 2001). From this perspective, it would not be surprising at all if any discussion of racial issues would be enough to cause an eye movement to a black individual. We termed this possibility the ‘association hypothesis’. In contrast, the ‘social referencing hypothesis’ holds that the minority individual is not looked at simply because they are broadly associated to the discussion, but specifically because the participants are seeking information about the potential offensiveness of the remark. We distinguished these two hypothesis by means of two experimental conditions. 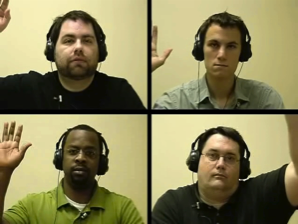 In an introductory passage of the video it was established that either all participants could hear each other (four person condition), or that the bottom two participants (which included the minority individual) had their headphones turned off (two person condition). Importantly, the conditions were identical once the discussion of affirmative action began. 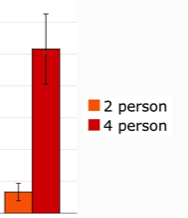 Whilst the association hypothesis predicts that the black individual would be looked at more in both conditions, the social reference hypothesis predicts this only in the four person condition, when he can hear the potentially offensive remark and make a potentially informative reaction. "Put your hands up if you can hear me"
Previously, you watched a subject in the four person condition who thought everyone could hear what was being said. 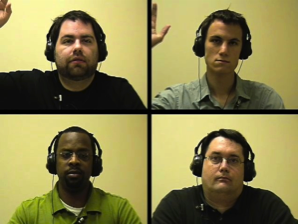 Now watch an eye movement recording of a subject in the two person condition who believes that the two people on the bottom row have had their headphones turned off. We found that participants spent dramatically longer looking at the Black individual if and only if he could hear the potentially offensive comments. Participants showed no interest in this individual in the two person condition when they believed he could not hear what was being said. The simple ‘association hypothesis’ was disproved. Instead, we have strong behavioural evidence that members of a minority will be looked at during instances of suspected discrimination when it is possible that they provide an informative response. This is a surprising result in the context of recent claims in the eye movement literature. Some researchers have suggested that listeners have a surprisingly shallow awareness of interlocutor’s mental states (Keysar, Barr, Balin & Brauner, 2000). In contrast, we have found sharp differences in the way that identical video images are inspected that depend on participants’ reasoning about an individual’s knowledge state, and their reaction to socially loaded information. This indicates that participants’ eye movements are influenced by a range of subtle linguistic and interpersonal and social factors. This research has attracted a little press interest too, with articles in Time magazine and an interview with Jennifer for Diverse: Issues in higher education. This was supported with generous support from the Leverhulme Trust in a two year project entitled, ‘Cognition in a Social Context’.